حدود چهار دهه از توسعه بتن خود تراکم می‌گذرد، اما همچنان استفاده از آن محدود می‌باشد. بخشی از مشکلات بتن خودتراکم شامل جدا شدگی، عدم قابلیت جاری شدن و پرکنندگی و پتانسیل ترک‌خوردگی بالا است. در این پژوهش خواص بتن خودتراکم حاوی عامل اصلاح لزجت مورد بررسی قرار گرفته است. 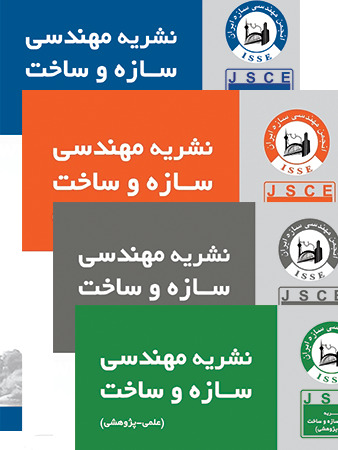 در ساخت بتن، الیاف پلیمری با دوز 1/0 ،125/0، 150/0 ، 175/0 و 20/0 و الیاف فولادی قلاب‌دار با دوز 50/0، 1، 50/1،0/2 و 50/2 درصد وزن سیمان استفاده شده و آزمایش‌های بتن خودتراکم تازه و سخت‌شده انجام گرفته است. نتایج آزمایشات بتن تازه نشان می‌دهد که افزایش هر دو نوع الیاف در بتن باعث کاهش جریان اسلامپ و افزایش مدت زمان T50 می‌شود. در آزمایش قیف V، کاهش مدت زمان تخلیه بتن خود تراکم مسلح به الیاف پلیمری تا دوز 125/0 درصد وزن سیمان مشاهده می‌شود. افزودن الیاف فولادی باعث افزایش مدت زمان آزمایش قیف V می‌شود. افزودن هر دو نوع الیاف قابلیت عبور بتن در آزمایش جعبه L را کاهش می‌دهد. آزمایشات بتن سخت شده نشان می‌دهد که با افزایش دوز الیاف فولادی، مقاومت فشاری کاهش می‌یابد. مقاومت فشاری در بتن مسلح به الیاف پلیمری در سن 7 و 28 روزه تا دوز الیاف 150/0 درصد افزایش یافته است. با افزایش هر دو نوع الیاف، مقاومت کششی افزایش پیدا می کند. نتایج آزمایش ترک‌خوردگی نشان می‌دهد که طول و عرض ترک ها با افزایش الیاف کاهش می‌یابد. افزودن الیاف فولادی تعداد ترک ها را می‌افزاید. 2M.Sc., Civil Engineering, Faculty of Engineering, Behbahan Khatam Alanbia University of Technology, Behbahan, Iran. 3Assistant Prof, Islamic Azad University Behbahan Branch, Behbahan, Iran. Self-compacting concrete (SCC). was developed about four decades before since that time it has been used very scarcely due to a number of problems including : separation, lack of flowability and filling ability, high cracking potential, and thereupon low compressive and tensile strength. In this study, properties of SCC containing viscosity modifying agent, steel and polypropylene fibers were investigated. polypropylene fibers with dosages of 0.1, 0.125, 0.20, 0.150, 0.185, 0.205, and hook end steel fibers with volume fractions of 0.5, 1, 1.5, 0.2 and 2.5 were employed; fresh and hardened SCC were examined. The results of the fresh concrete tests revealed that rise of the both fiber types reduces the slump flow and raises the T50 time. In the V-funnel test, the time shortened with polypropylene fibers up to dosage of 1.25%, and then soars. Growing steel fibers elongate the time of the V-funnel test. Adding both types of the fibers reduces the passing ability of concrete in the L box test. Hardened concrete tests indicated that the compressive strength is falling by rising the dosage of steel fibers. The compressive strength at the age of 7 and 28 days improves up to the polypropylene fiber dosage of 1.50% and then declines. At the age of 90 days, strength trend changes in dosage of 0.1. Tensile strength grows as the both fibers increase. The crack test results show that the length and width of the cracks lower with the growth of the fibers. Adding steel fibers boosts the number of cracks.